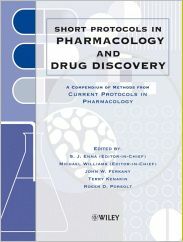 Short Protocols in Pharmacology and Drug Discovery provides condensed descriptions of more than 350 methods compiled from the successful title Current Protocols in Pharmacology. The book is specifically designed to provide quick access to step-by-step instructions for the essential methods used in every major area of pharmaceutical research, and especially stresses drug discovery techniques. This volume is an authoritative and indispensable guide for all life scientists, researchers, and students at the graduate and advanced undergraduate level, doing research in academic, government, and pharma/biotech laboratories.